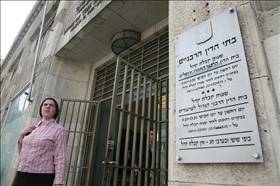 "For the first time in its history, the Rabbinical Courts Administration has appointed a woman as a legal advisor to its courts, a significant achievement for women’s rights in the religious establishment. Proponents of the step hailed it as the first time a woman would be involved in the judicial framework of the rabbinical courts. The position of legal advisor is extremely influential, since rabbinical judges cannot issue rulings, which contravene Israeli law, and legal advisors review and can require changes to important and precedent-setting rulings." This development conveys a threatening dimension, which we should not lose sight of. At the same time, we feel that this development conveys a threatening dimension, which we should not lose sight of. On the one hand, this is a very significant step forward in integrating into the rabbinic establishment. Attorney Ben-Eli self-identifies as "feminist" and "Mizrahi", which promises to enrich the thinking process (at least the legal thinking process) of this otherwise conservative rabbinic establishment. On the other hand, it is clear that this appointment would not have come about if not for the fear of the rabbinic establishment of the Supreme Court, and the fact that it's age-old policy of excluding women was challenged before the Court. This adds to the mounting frustration among political and rabbinic extremist Orthodox functionaries, who rightly view the Supreme Court as the only major branch of government whose arm they cannot twist. This frustration finds expression in both accelerating verbal venom spewed against the Supreme Court, as well as in tangible political schemes to muzzle and erode the Court's independence and the Court's judicial review authority. This is an eventuality that we cannot afford if Israel is to remain even an imperfect democracy, as many refer to it now.